My poor 15 year old son is having a bit of a hard time adjusting to our new way of life. In fact, it would be fair to say, he thinks I’ve gone completely mad. One thing that is bringing him new-found confusion, is trying to distinguish between what we now put into the compost and what we now keep to use. Example number 1, my beautiful organic lentils which I had been soaking overnight – thoughtfully and unsalvageably added to the compost bin. When I told him that he had thrown out my dinner he said “but how could that NOT be compost, it sure looks like compost, I can’t believe you are eating compost”. 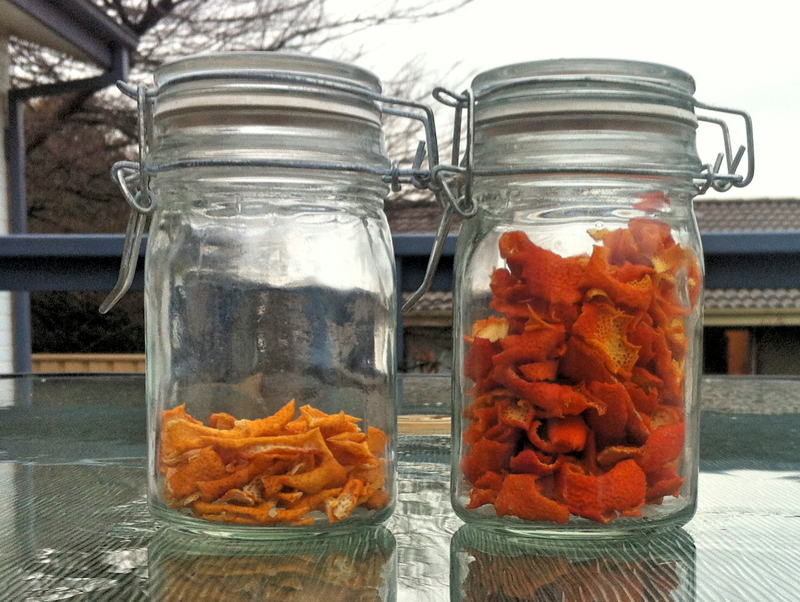 Example number 2 – my mum has kindly been keeping her orange peels for me, and on the way out of her place the other day, I asked said son to take the container of orange peels out for me. He very helpfully threw the orange peels in the bin on the way to the car. These could be salvaged, and so I made him salvage them. We are now having a daily chat about what is, and what isn’t compost, but there are still casualties. As I am now doing my best to eat seasonally (something you will be hearing more about later), we have been eating stacks of citrus over winter, which of course means stacks of citrus peels. But when I started my (beautiful) compost pile this year (yep, you will be hearing more about that one too) I read that you shouldn’t put too much citrus in the compost. I was sure there must be something you could use the peel for, and was super excited to find that there is actually a million different things you can do with it. Ok, so a million is probably stretching it a bit, but there are plenty of ways and as we are now entering into spring, I wanted to share this while there is still some fresh, local citrus around. In my search I found an article I liked on The sprouting seed called “30 ways to use orange peels” which has a variety of ideas for use in food, beauty products, and around the home. Apparently if you rub yourself with fresh orange peels you can even deter mosquitos (the only problem with this one being, there aren’t usually too many mosquitos around when oranges are in season, but at least you will can be prepared). Another article I liked is “25 uses for lemon peels” from the DIY natural website, lots of cleaning ideas in this one. I haven’t had a chance to try out all 55 of these suggested uses yet, but I have started drying all my citrus peel in anticipation. I just laid them out on baking paper for about a week and they dried beautifully. 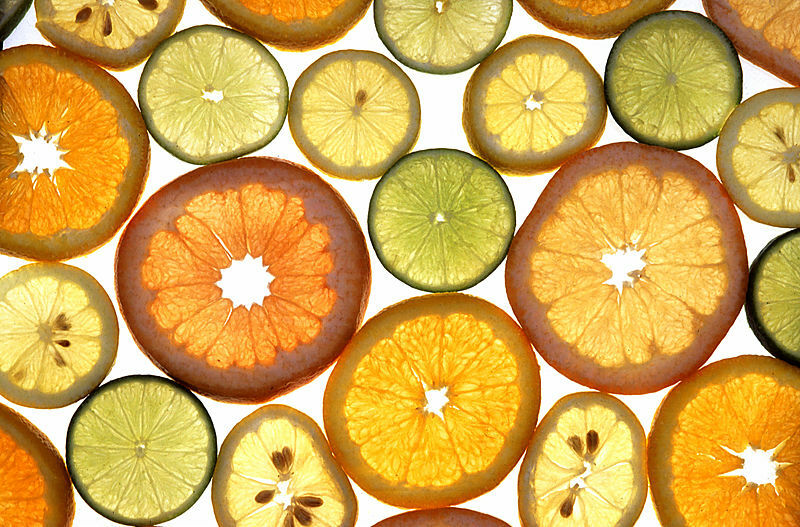 One thing to note here, if you intend to use the peel in food or drinks, make sure you use organic citrus, and try to remove as much of the white peel as possible so that you don’t end up with a bitter taste. Here are my little beauties so far…. But the most genius of ideas, as far as I am concerned, I found in a fabulous book I borrowed from the Library called “Homemade” which is a Readers Digest Book. I would highly recommend getting your hands on a copy of this book as it has (the title tells us) “702 ways to save money and the earth”, and some of the ideas are so simple, its crazy. But the genius recipe I am talking about today is called “citrus disinfectant” and it can replace the citrus orange cleaners you may buy from the shops. This one is so simple, you may not even believe it. 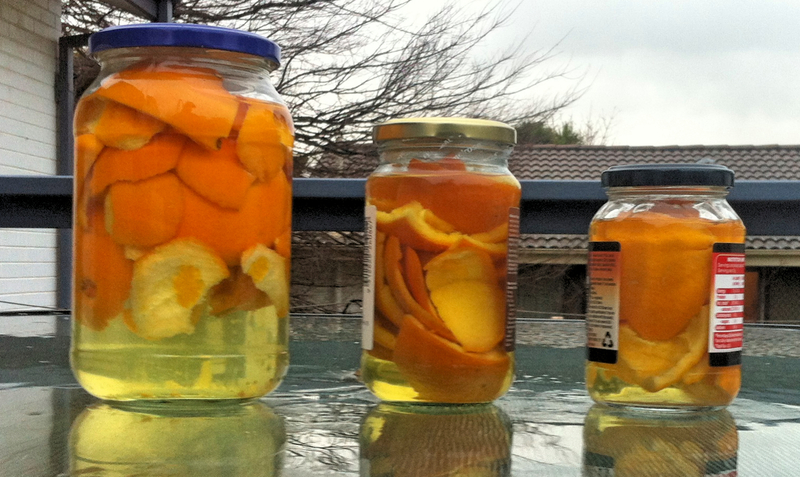 Orange peels – as many as you have. You literally just grab your orange peels, you don’t need to worry about doing anything to them, and put them into the glass jar. You want the size of your glass jar to be so that the orange peels fill it nicely, then pour vinegar over the orange peels until you fill the jar all the way to the top. Put the lid on and put the jar away somewhere for 2 weeks. Over the 2 week period, give the jar a shake every couple of days or so. And at the end of the 2 weeks, strain the vinegar from the jar and pour into a spray bottle and add some water. Depending on what you are using it for, will depend on how much water you want to add, it’s basically up to you as to how you like to use it. One of the other cool things about this is, because you are basically pickling the oranges, you don’t have to worry about the shelf life . So you can make stacks of it during orange season to last you through the non-orange season. You can also make this with any other citrus you like lemons, grapefruit, or a combination. One of my clever work colleagues has just made some from blood oranges. The readers digest book also suggests that you can deodorize a room by setting out a small bowl of the undiluted citrus vinegar. Genius. Categories: Cleaning Products, Recipes | Tags: citrus, citrus pe, compost bin, compost pile, homemade citrus cleaner recipe, Homemade cleaner, homemade cleaner recipe, Natural Cleaner | Permalink. When do I get my complimentary jar of my orange peel cleaner? ?